A possibly ground-breaking idea has been kept on life support after Ecuador revealed its Yasuni-ITT Initiative had raked in $116 million before the end of the year, breaking the $100 million mark that Ecuador said it needed to keep the program alive. Ecuador is proposing to not drill for an estimated 850 million barrels of oil in the Ishpingo-Tambococha-Tiputinin (ITT) blocs of Yasuni National Park if the international community pledges $3.6 billion to a United Nations Development Fund (UNDF), or about half of what the oil is currently worth. The Yasuni-ITT Initiative would preserve arguably the most biodiverse region on Earth from oil exploitation, safeguard indigenous populations, and keep an estimated 410 million tons of CO2 out of the atmosphere. However, the initiative is not without its detractors, some arguing the program is little more than blackmail; meanwhile proponents say it could prove an effective way to combat climate change, deforestation, and mass extinction. 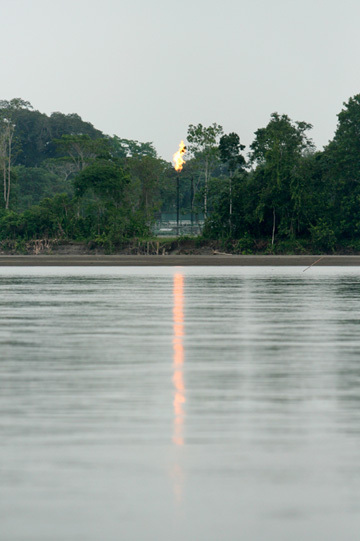 Gas flare at an oil refinery across the river from Yasuni National Park and near Coca. Photo by Jeremy Hance. Money was raised from a “crowdfunding” initiative and includes donations from governments, environmentalists, and movie stars. However, the bulk of the money has come from two places: Italy forgave $51 million of debt to Ecuador and Ecuador’s president, Rafael Correa, donated $40 million from a massive lawsuit he won against an opposition newspaper. Other donations were smaller, including: $100,000 from Turkey, Chile, Colombia, and Georgia; $500,000 from Australia; $1.4 from Spain; and $2 million from the Belgium region of Wallonia. Individual contributors included former US Vice President Al Gore and celebrities Leonardo DiCaprio, Bo Derek and Edward Norton. Monies donated to the UNDF fund will be used for nature conservation and renewable energy projects. While Germany announced earlier in the year that it was backing away from supporting Yasuni-ITT, it did pledge $48 million in technical assistance. Niebel also wrote at the time that there were no other donors on board, a criticism that can no longer be made. Still, donors en masse appeared to believe the promises of the unique program outweighed its risks. 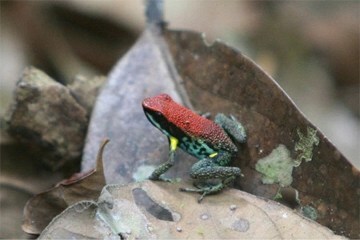 Poison dart frog in Yasuni National Park. Photo by Jeremy Hance. Recent research has found that Yasuni National Park may contain the most biodiverse ecosystem in the world: Yasuni sports the highest number of species in the western hemisphere based on data on birds, mammals, amphibians, and plants. Researchers have also found more tree species (655 to be exact) grow in a single hectare in Yasuni than in all of the US and Canada combined. But bugs may win the day yet: according to entomologist, Dr. Terry Erwin, a single hectare of rainforest in Yasuni may contain as many as 100,000 insect species: an estimate that, if proven true, is the highest per unit area in the world for any taxa, plant or animal. “[Yasuni-IIT is] a very important message that we Ecuadorians are sending to the world since we are trying to demonstrate that there is an alternative to extractivism,” David Romo Vallejo, professor at the University of San Francisco Quito and co-director of Tiputini research station in Yasuni National Park, recently told mongabay.com. Given that many scientists believe governments and the public are acting too slowly to effectively counter climate change and biodiversity loss, innovative programs with immediate results (i.e. not drilling in the park) such as Yasuni-ITT may become increasingly attractive.